Attention Ted Williams collectors! Here is a wonderful opportunity to obtain a world class and extremely rare Ted Williams autographed seriagraph limited to a worldwide edition of only 99 worldwide...we were lucky enough to get our hands on two of these! It is the special gold edition of the Carlo Beninati seriagraph, which retails unframed for $3500 on beninati.com! (BUT THEY'RE SOLD OUT NOW!) The entire edition of this beauty had been retained by the Williams family (Green Diamond) until recently. Any true Ted Williams collector knows full well that any limited edition item, with a small edition size of only 99, will surely be a sought after treasure with strong appreciation potential as the years pass. The outside measurements on the frame are 40" tall by 31" wide. This fabulous piece is authored by one of the most renowned sports artists of the 20th century, Carlo Beninati. 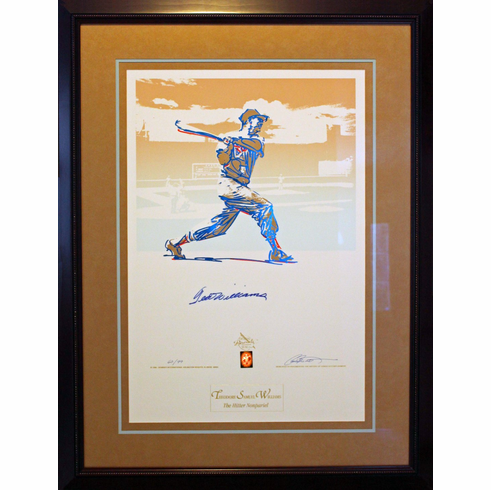 This piece is absolutely stunning, an exquisite Ted Williams autographed original seriagraph, only 99 people in the world will own one of these. THE GOLD COLOR OVERLAY IN THE SERIAGRAPH ALONG WITH THE GRAPHICS ADD TO THE SENSATIONAL APPEAL OF THIS BEAUTY. Entitled "Theodore Samuel Williams, Hitter Nonpariel", this seriagraph was originally marketed unframed by Mr. Beninati for $3,995 in 1996, and you will see on BENINATI.COM which is sold out. However, very few of these were actually released by the Williams family who chose to retain the gold edition for over 13 years, until now. It is produced on a very heavy stock paper with a multi color seriagraphic process including a gold and blue overlay, which produces a sensational color combination. The images truly do not do the piece justice, it is a wonderful, first class and nostalgic display. Ted has autographed this piece in bold blue sharpie. The autograph is huge (over 6 inches wide), bold and perfectly done prior to Ted's strokes, so it is straight and flowing. This seriagraph comes directly from Green Diamond, Ted's family memorabilia company. It is signed by the artist and is also hand numbered by the artist. It comes with the original Green Diamond hologram affixed to the seriagraph along with the Green Diamond Certificate of Authenticity. The Certificate has the edition number and also the Green Diamond official hologram on it. AUTHENTIC Ted Williams autographs are steadily drying up, especially on limited edition unique items with small edition sizes such as this. The family is sold out of much of their autograph stock, so naturally demand is starting to outstrip supply and cause pricing to increase, especially with The Red Sox making the playoffs year after year! Don't let this oustanding display get away, this piece of Ted Williams history truly belongs in Cooperstown or the Smithsonian! Just an incredible long term investment piece and a sensational display! It is professionally framed inside a cherry wood frame including Gold (Aged Copper) and Light Green (Twilight) acid free triple matting which complements this piece perfectly. Masterpiece UV glass minimizes the glare and guarantees the artwork forever! We only have two of these available! SPECIAL PRICING WHILE SUPPLIES LAST!